Chateauversailles.fr is the site of the Public Establishment of Versailles. Clicking on the logo takes you back to the homepage. The search engine text box can be found at the top of every page. When you perform a search, the search engine lists the chateauversailles.fr pages which best match your specifications. The search engine uses “Google Custom Search” technology from the company Google. All the pages on the website (apart from the homepage and dynamic pages) have breadcrumbs displayed above the main content which serve as a reminder of your current location and allow you to return to previous browsing levels. At the bottom of the screen there is a “back to top” link (in the form of an arrow pointing upwards) which quickly returns you to the main menu and navigation path. You can navigate from one link to the next using the “Tab” key (repeatedly press “Tab” until the desired link is selected, then confirm with “Enter”). 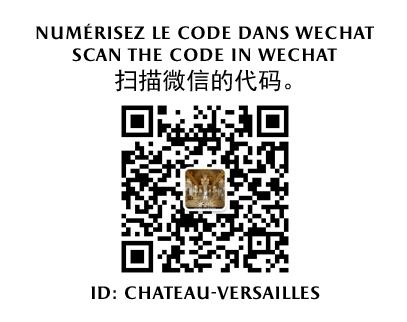 Every page of the chateauversailles.fr website is optimised for printing and downloading from the browser in PDF format. The pages can be printed by clicking on your browser’s “print” icon (File > Print) or on the “print page” icon at the top of the page. When a page is printed, all of the navigation elements will be hidden to ensure that you can print only content which is useful to you. Keyboard users can print any page on the website using the key combination “Ctrl + P” while on the relevant page if you are using a PC, or “Cmd + P” if you are using a Mac. Keyboard users can use the key combination “Ctrl + D” if you are using a PC, or “Cmd + D” if you are using a Mac. This website adheres to W3C specifications and is compatible with XHTML 1.0 Strict and CSS2. Some terms, acronyms and abbreviations are underlined with small dots. A question-mark cursor shows you the definition of terms or acronyms when the mouse hovers over them (each term is only defined once per page, the first time it appears). The "A-", "A" and "A+" buttons in the menu on each page allow you to adjust the font size. If you are using a PC, use the key combination “Ctrl” + “+” (the “plus” key) to increase the font size. The key combination “Ctrl” + “-” (the “minus” key) reduces the font size. Pressing these keys multiple times will increase or decrease the font size in increments. The key combination “Ctrl” + “0” (the number “zero”) returns the font size to its default setting. If you are using a Mac, replace the “Ctrl” key in the PC instructions above with the “Cmd” key. The site’s design is separated from its content through the use of style sheets. The use of CSS position properties, which fully separate presentation and content, ensures that documents retain a logical order outside of the CSS: heading, menus, content etc.